The Bears Pit: Politics Pit » Real or fake? Home » CHIT-CHAT » Politics Pit » Real or fake? 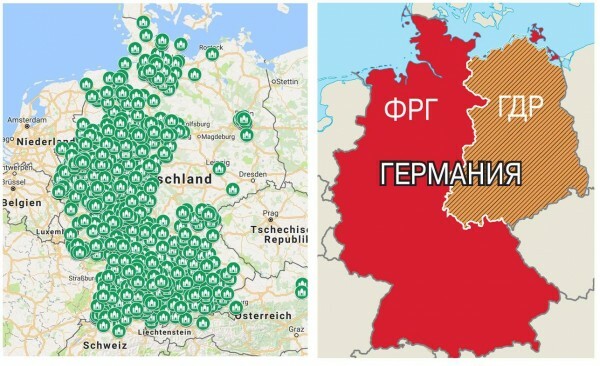 Found this picture showing mosque placements in Germany. It is at least plausible and consistent with both other maps and the policies regarding foreign workers in the 70s/80s - i.e. the west mostly drawing from Turkey and SW-Europe and the east from places like Kuba and Vietnam. I understand why this could be in 1980x, but nearly 30 years have passed - why nothing was changed? In Russia, thousands of mosques and churches were built after 1991 everywhere, and I think muslim migration to Germany did not end in 1990, or maybe they don't want to live in eastern Germany for economical or some other reasons. Yep, last point's pretty much it. The east is still catching up economically so they stay/new ones go to the established communities. Russia is different I presume. You probably have muslim communities all over the country. You also have different laws and conditions than Germany. As a muslim immigrant where would you settle? In an area where there are almost no other muslims? In an area where people are still paid less for the same work? In an area where there are still much less jobs (especially well paid jobs for high qualifications)? You'd probably go to the other part of the country just like lots of Germans from the eastern parts did/do. I don't expect that to change for quite some time because people simply have to make a living and they expect it to be better in the west. That's also the main reason in my opinion why so many (economic) refugees want to get to Germany, Austria, France, GB or the Nordic countries. Given it, I guess, comes from russian source, it might as well be exaggerated, but not necessarily is. With historacal and economic forces at work this sounds legit. @all Thank you, it was interesting reading! I haven't seen similar pictures for Russia but I belive most new built mosques (since 1991) will be in traditional muslim regions but also in Moscow because of similar economical reasons.